This brings me to my next question: obviously my gigabit isn't being utilized just yet and it's probably running on 100. Will adding a gigabit switch where the green linked wireless N AP is and connecting green AP, server and personal PC to it and connecting the gigabit switch directly to the main router improve local network sharing performance. Well my A/P's have Gb Ethernet ports and all my switches are Gb as well. So LAN connections limited to 100Mbps may be limiting bandwidth as far as trying to stream to all network locations. All of the wired connections should be connected to Gb switches or A/P's with Gb LAN ports, and my A/P's can do 300Mbps "wireless" . This presents no problems with streaming HD movies to all network locations. It would greatly improve your performance. atm everything connecting to your server is running at 100Mbps or 12.5MBps. Its pretty obvious that once 3 people are streaming your exceeding your 12.5MBps so you get choppy signal. But will the Switch benefit the none-gigabit APs? I'm more concerned with the output of the server to the rest of the devices than the devices to the server which I know will be limited by the APs and wireless limitations. What I'm thinking is: using a water analogy is that if you add a bigger main pipe the adjoining smaller pipes should get better water flow. You really have to look at the flow of the traffic. currently your AV server is connected to a 100Mbps port. This limits everything connecting to it to 100Mbps, even the stuff connected to the gigabit router. After your AV server is moved to a gigabit port then anything on the gigabit port can access it at 1Gbps while the other devices are still connecting at 100Mbps. Your bottleneck will still be your 100Mbps AP's but you will not have as much traffic flowing through them. Unless you have 10 devices connecting to the same AP and streaming at the same time. From my point of view those AP's and switches need to be Gb capable, the one Gb switch won't eliminate all of the bottle necks I see here. Yes the Gb server and the Gb router are both handcuffed because they are both sitting behind 100Mbps A/P switch's so installing the new Gb capable A/P would help there. 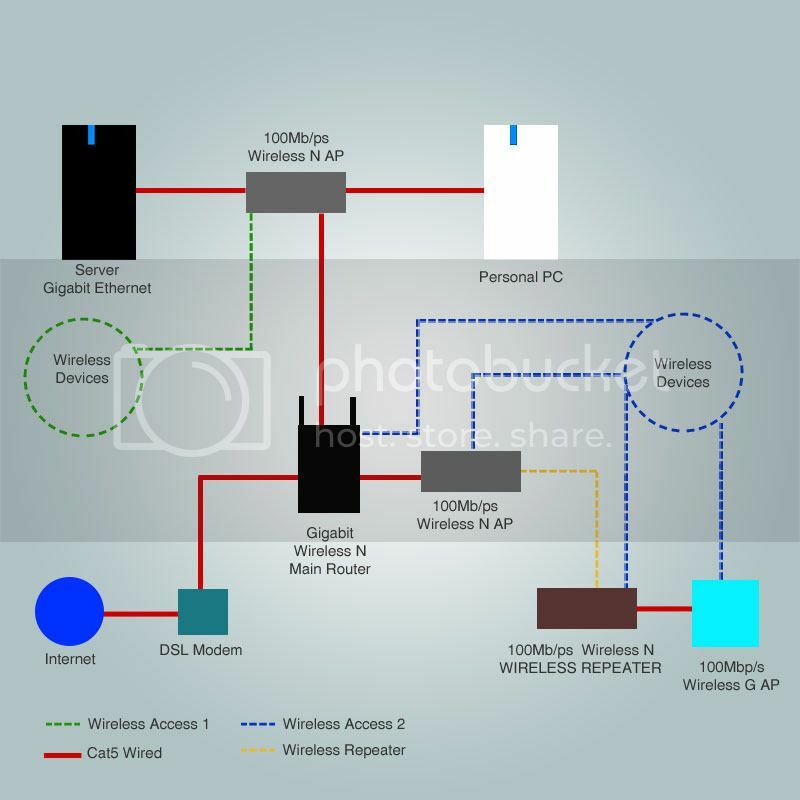 But the other wireless devices connected to the 100Mbps A/P, which is to the right of the router in the diagram will still be bottle necking through that 100Mbps A/P. Here is what I use for the AP which has Gb LAN ports and can handle 300Mbps wireless. Your point of view is correct. Placing everything on gigabit will eliminate all bottlenecks shown. The downfall is that in the situation it can be expensive. I still believe the first step step should be placing the av server on gigabit and going from there. Unless there is high traffic on the wireless ap. Since each wireless is on 100Mbps lines they each will share the gigabit access to the server instead of sharing (1) 100Mbps connection. Yes replacing the one A/P between the main PC and router will do the most good as the Op suggested, before spending too much money on three Gb capable A/P's "expensive" I'd try replacing that one A/P first.